Puj spas za sve nas! Posle nasilne smrti, prilikom uviđaja, mesto incidenta policija označava incidentnim crtežom. Žrtva biva opcrtana u položaju u kojem se zatekla pošto je nastupila smrt. Život se može sačuvati na više načina, a najbolji mogući je oprez. Ako razmišljamo o mogućoj opasnosti, predviđamo moguće zamke, isprobavamo i treniramo smrt, stičemo otpornost i na taj način se štitimo. Kredom opisujemo konturu tela i tako zlo ostaje zarobljeno na crnom papiru. Umetnost stavljamo u funkciju zaštite. Reconstruction of Crime was initiated by the group Led Art in 1994, during war destruction in former Yugoslavia. The project is based on the idea that the increasing evil has to be opposed with all the available means, and artists will oppose evil with art. The procedure was borrowed from police practice when, after an incident with a fatal result, the contour of the body of the victim is drawn with a chalk, thus creating an “incidental drawing”. It has been carried out since 1994. “Urban Spells – Phew, we are all safe”: incidental prints, photography against spells, expeditions to landfills, public hair-cutting, creating flags… are all used as elements of art magic with which “consumers”/viewers are freed from fear and given back a hope in salvation. It will turn out that artistic intervention in the field of current politics, society and culture has a great potential. That is why through transformations and interweaving Reconstruction of Crime became part of almost all the projects by Led Art and Art Klinika to this date. Reconstruction of Crime took place through different techniques. – Landfills of communal waste Belgrade, Nis, Plzen (Poland), Labin (Croatia). The Black Book was presented at the 55th International Book Fair in Belgrade in October 2010. Members of Art Klinika presented the accompanying performance of contour drawing as a reenactment of events from the content of the Black Book. 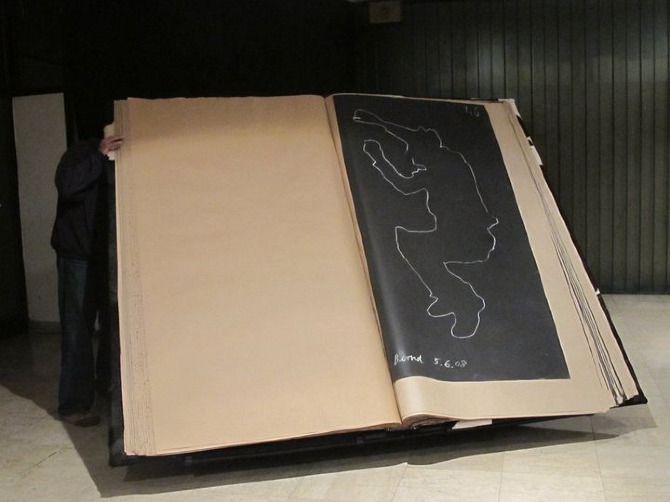 The Black Book is an art object/sculpture of considerable size (it is aiming at a nomination for the Guiness Book of World Records). 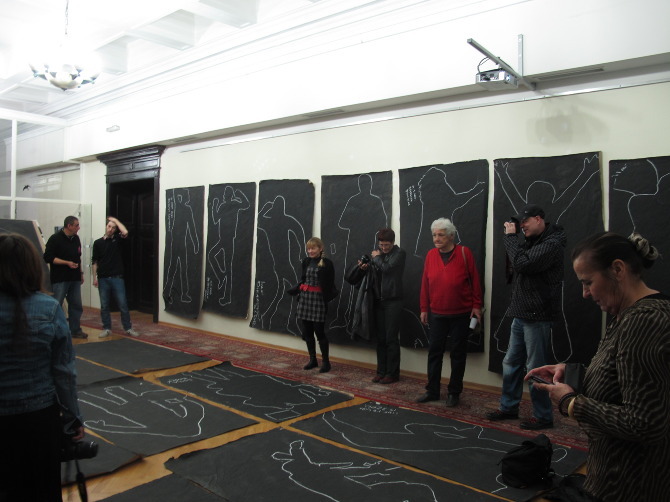 In it chalk drawings on black papers are gathered (incidental drawings), created in the “Reconstruction of Crime,” art actions by the group Led Art, later Art Klinika, during the period 1994-2009. Actions and performances of contour drawing were held in Serbia and abroad (Belgrade, Novi Sad, Zrenjanin, Niš, Priština, Czech Republic, Croatia, Austria), and more than 1000 people participated in it, including people from public, political and cultural life. The book was made under the patronage of the Museum of Contemporary Art of Vojvodina, and it was made by the team-in-charge of Art Klinika and of the art and artisan workshop. It contains more than 100 drawings, size 2 x 1.3 m, weight around 120 kg, covers made out of real leather, it is mounted on a metal stand.